The “Double 0″ Floating DJ Booth has a smooth, stacked appearance that can sit in houses and clubs alike. The booth shown does not include any pedestals but these can be added for an additional cost. Two turntables are shown in the picture although we can size the booth to fit CDJ, DVJ or other equipment. 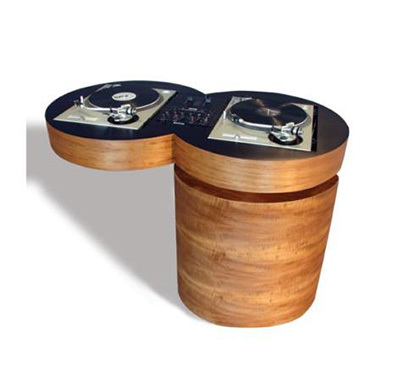 This version of the 00 DJ Booth has been designed to hold the simple combination of two turntables (can be specified with CDJ / DVJ units) and mixer. Please contact us if you’d like to discuss a different configuration and include any equipment details when ordering. We’ll always get back in touch to confirm everything. The booth shown in the photograph is a wood construction, hand-veneered in various wood species. CDJ Pedestals can be added to the booth for $760.00 each or $1470 for a pair Please contact us if you’d like to discuss a different configuration.